The Murder of Willie Lincoln is an exciting historical fiction debut by award-winning political journalist and Washington insider Burt Solomon. Washington City, 1862: The United States lies in tatters, and there seems no end to the war. Abraham Lincoln, the legitimate President of the United States, is using all his will to keep his beloved land together. But Lincoln’s will and soul are tested when tragedy strikes the White House as Willie Lincoln, the love and shining light in the president’s heart, is taken by typhoid fever. But was this really the cause of his death? A message arrives, suggesting otherwise. Lincoln asks John Hay, his trusted aide—and almost a son—to investigate Willie’s death. Some see Hay as a gadfly--adventurous, incisive, lusty, reflective, skeptical, even cynical—but he loves the president and so seeks the truth behind the boy’s death. And so, as we follow Hay in his investigation, we are shown the loftiest and lowest corners of Washington City, from the president’s office and the gentleman’s dining room at Willard’s Hotel to the alley hovels, wartime hospitals, and the dome-less Capitol’s vermin-infested subbasement. We see the unfamiliar sides of a grief-stricken president, his hellcat of a wife, and their two surviving and suffering sons, and Hay matches wits with such luminaries as General McClellan, William Seward, and the indomitable detective Allan Pinkerton. What Hay discovers has the potential of not only destroying Lincoln, but a nation. “The pace and characterizations in this mystery are superb. The historic backdrop is expertly painted, and everyone’s talk rings true: slave, free, secesh, Lincoln, even lascivious Kate Chase. But do not expect the expected ending.”—James M. Cornelius, Curator, Abraham Lincoln Presidential Library & Museum, Springfield, Ill.
Burt Solomon is a contributing editor for The Atlantic and National Journal, where he has covered the White House and many other aspects of Washington life. In 1991 he won the Gerald R. Ford Prize for Distinguished Reporting on the Presidency. He is also the author of the acclaimed Where They Ain't, a history of baseball in the 1890s. Solomon, his wife, and their two children live inside the Beltway. 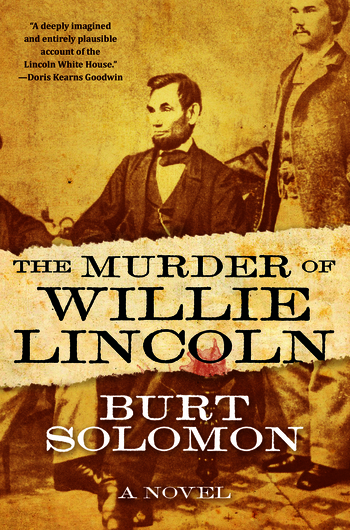 The Murder of Willie Lincoln is his first novel.